Published by Joshua Clare-Flagg on 2 Oct, 2017. 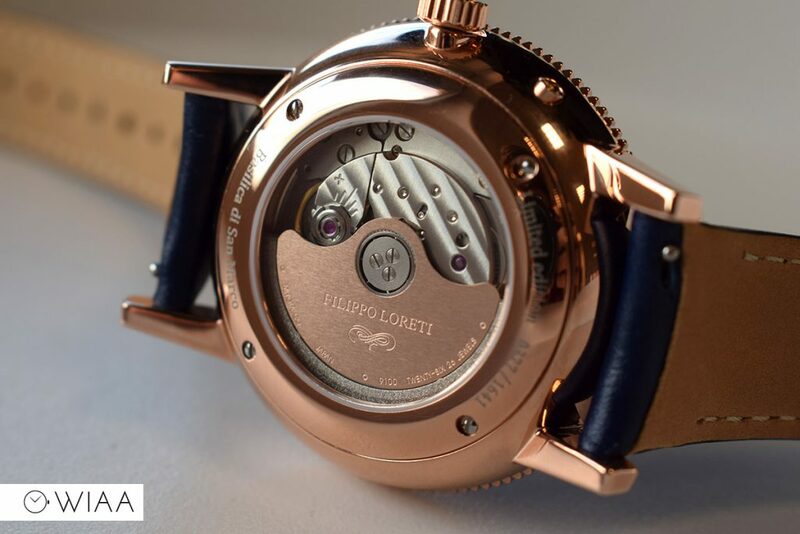 Filippo Loreti were one of the first to make that claim you see so much of nowadays: “disrupting the watch industry”. It seems every other brand is out there to disrupt it currently. There was a bit of a misunderstanding about them seemingly claiming to have Italian heritage, however the two brothers who founded Filippo Loreti – Matas and Danielius Jakutis – are Lithuanian. 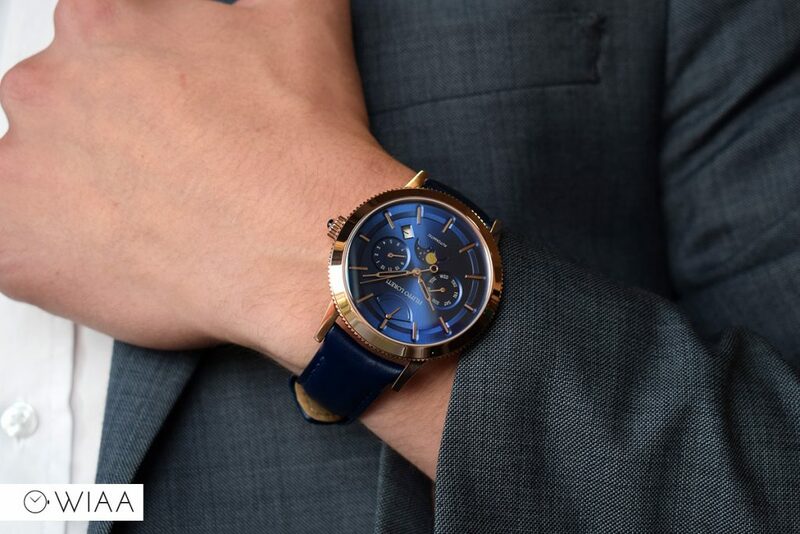 They’re actually just inspired by Italian watchmaking and architecture. A number of people seem to be rather disgruntled about this brand. 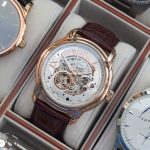 It’s hard to tell why exactly, but I believe it’s to do with how they oversold their initial record breaking Kickstarter campaign (they raised an insane €4.8 million, selling 18,000 watches) which left many people waiting a very long time to receive their timepiece. An honest mistake; their original goal was a mere €20,000 so I’m pretty sure they weren’t expecting the volume of orders they’d have to fulfil. I’m more interested in the here and now. 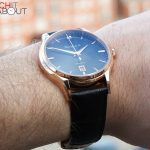 Obviously the initial teething issues are all in the past, so how does this watch stack up again the competition of this price range, and is it good value for money? 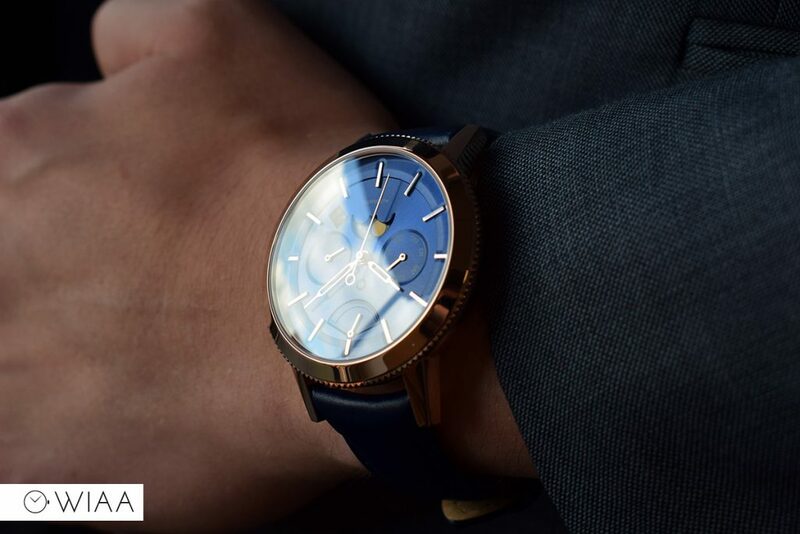 The case is rose gold plated, and fully polished to really create a statement – just be careful because it will pick up hairline scratches. 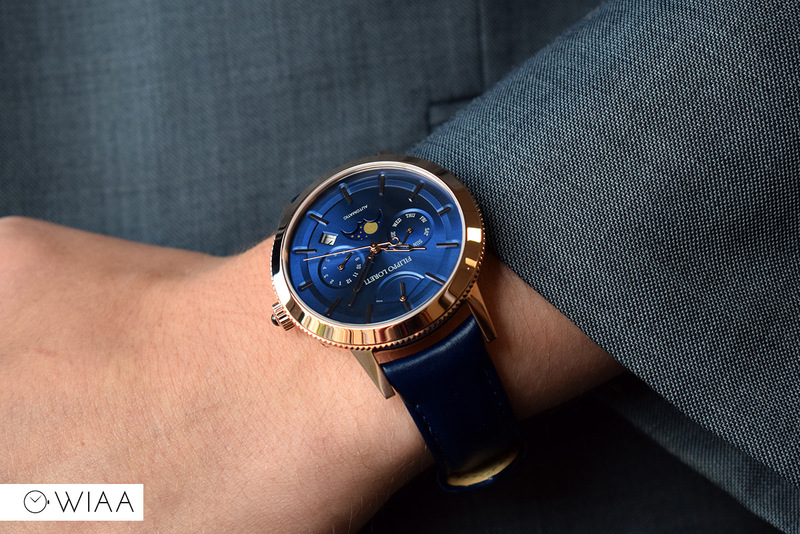 It’s a super shape – a lovely bulbous affair with a smaller case back than top, so it feels smaller on the wrist than the 42mm diameter. 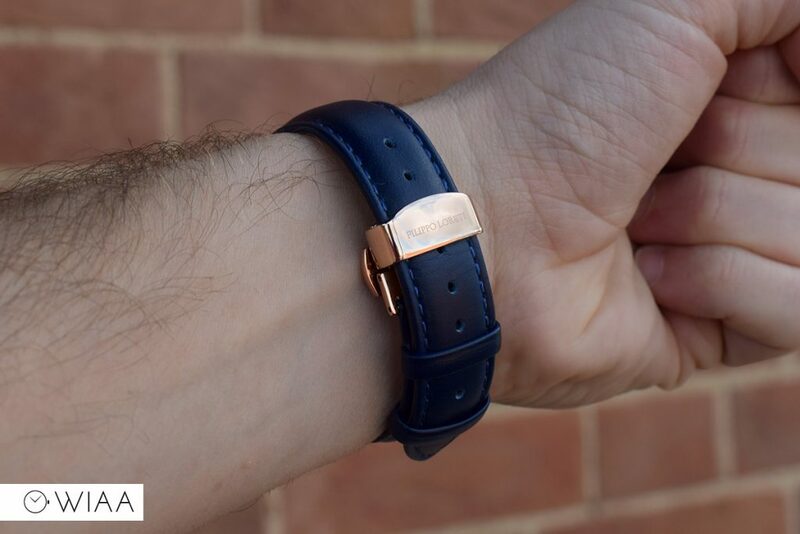 The weight of 108g feels good on the wrist; give you the sense of quality. 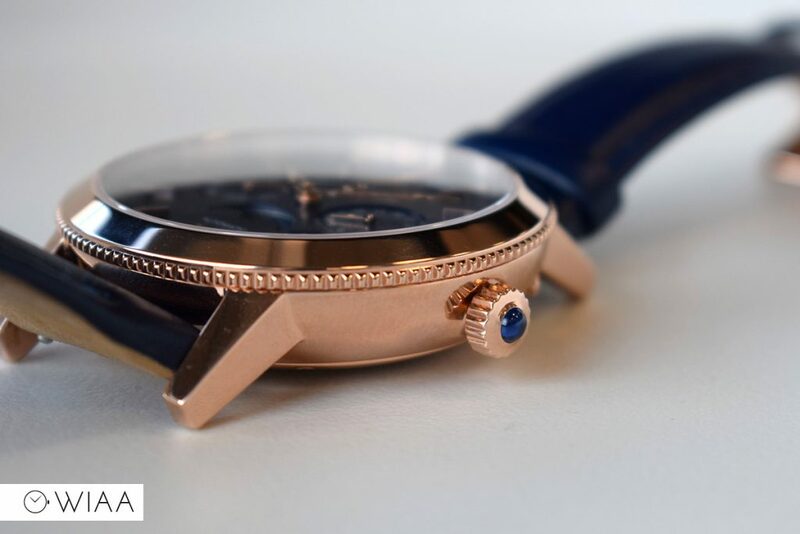 Sitting on top of the case is a double-domed sapphire crystal. It’s thick (gives a good thud when you tap it), but it really should have better anti-reflective coating. 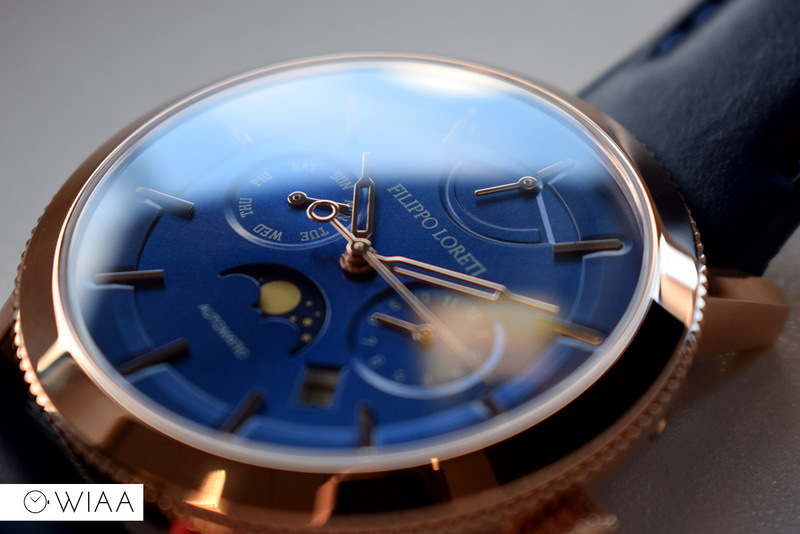 This, in my opinion, is the one and only thing that is a bit of a let down with the watch – the crystal is very reflective. There’s a button on side, located at 2 to advance the month indicator. 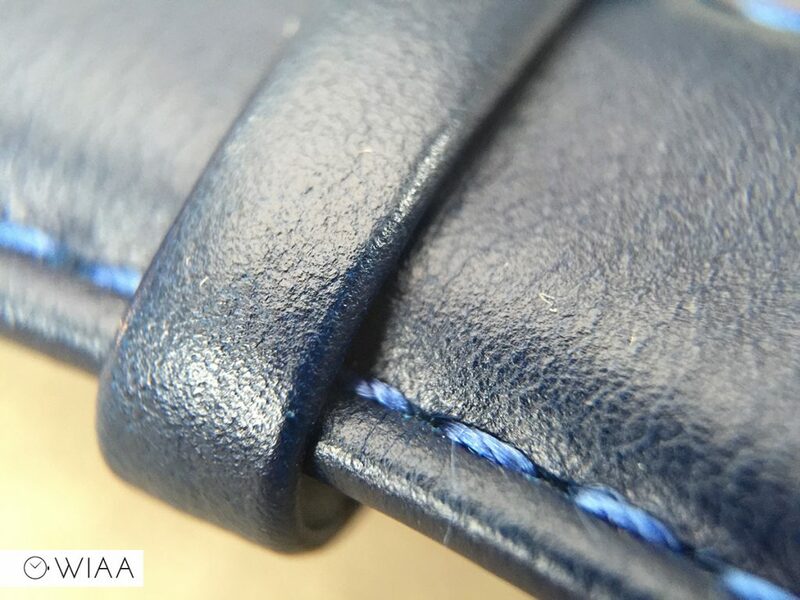 Alongside this is the push-pull crown, which has a thick toothed grip which is very easy to use for winding / setting. 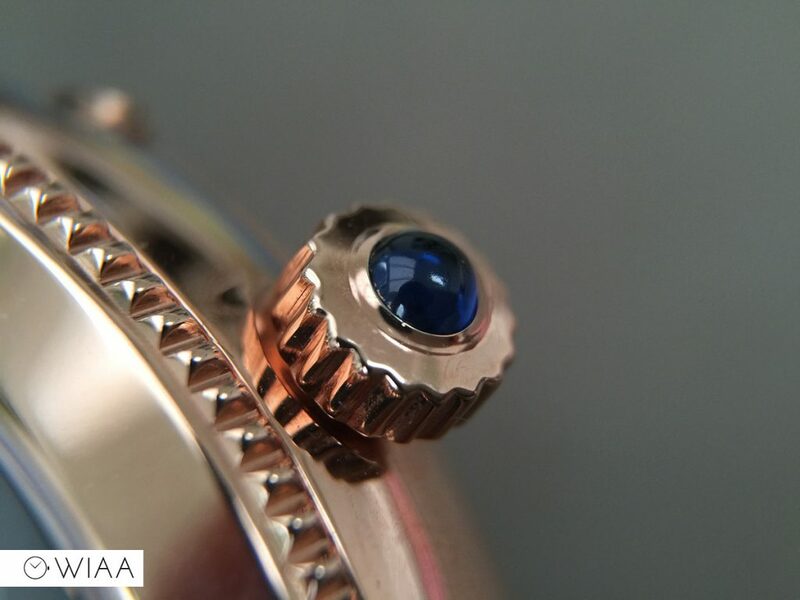 It has a faux blue jewel placed on the end. The bezel has a well machined toothed edge, splitting up the bezel from the case main and providing a visual line to divide them. 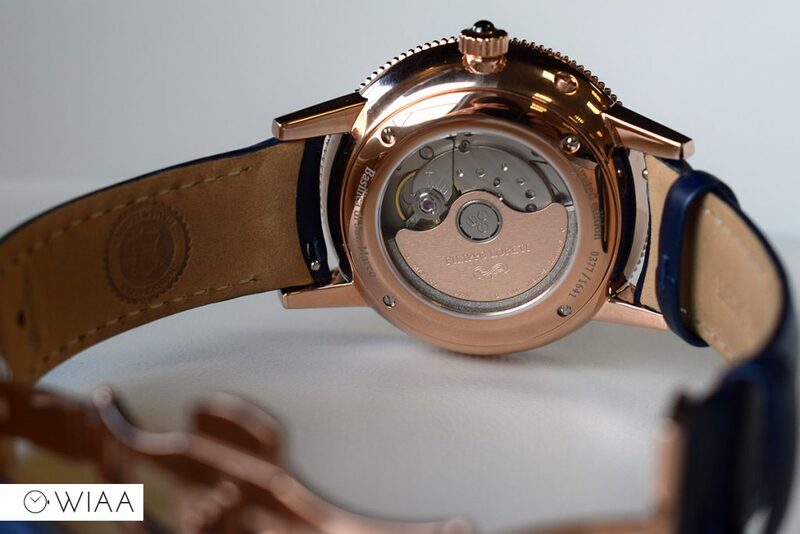 The caseback is simple: 4 screws hold it in place, with an exhibition window sitting proudly in the centre. There’s a couple of details laser etched above and below the window, it’s a shame they’re not engraved. 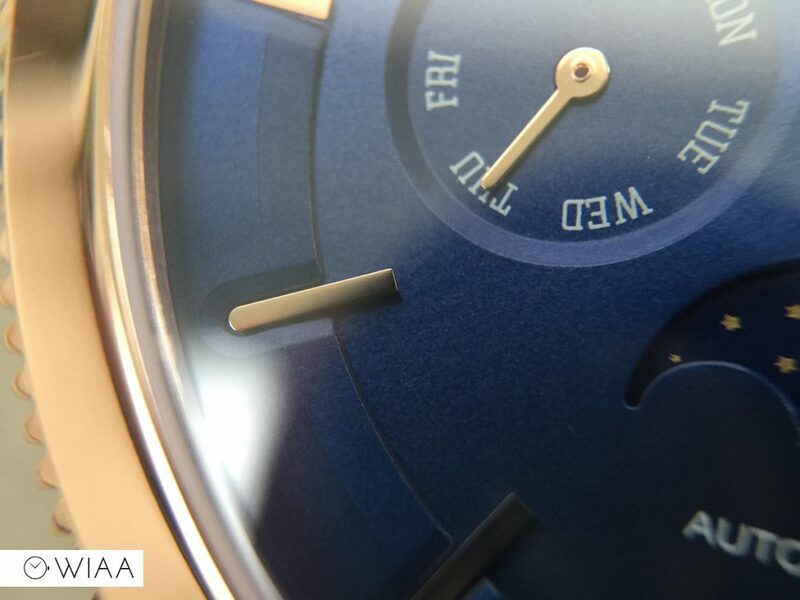 The dial is a luxurious blue, and is quite busy thanks to the multiple subdials. 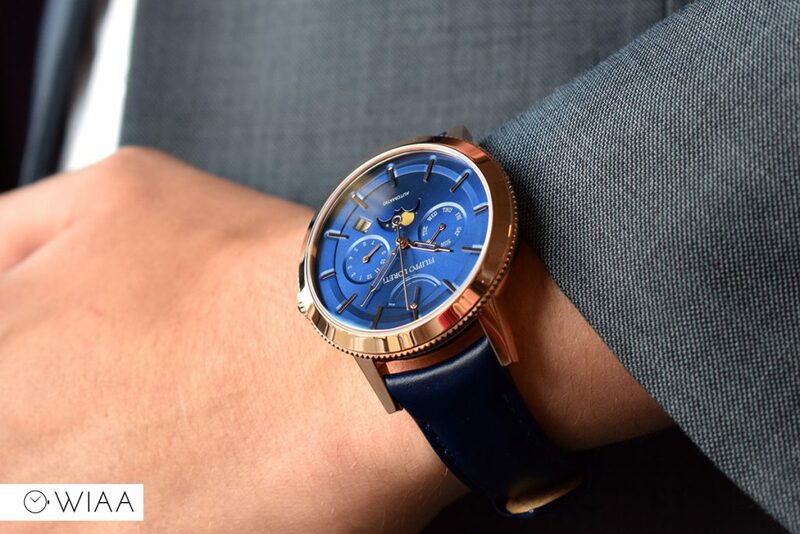 The power reserve at 12 is subtle and classy, and is something you don’t see all the time so it’s a welcome addition. There’s also a day indicator at 9, month at 3, and date window at 4:30. 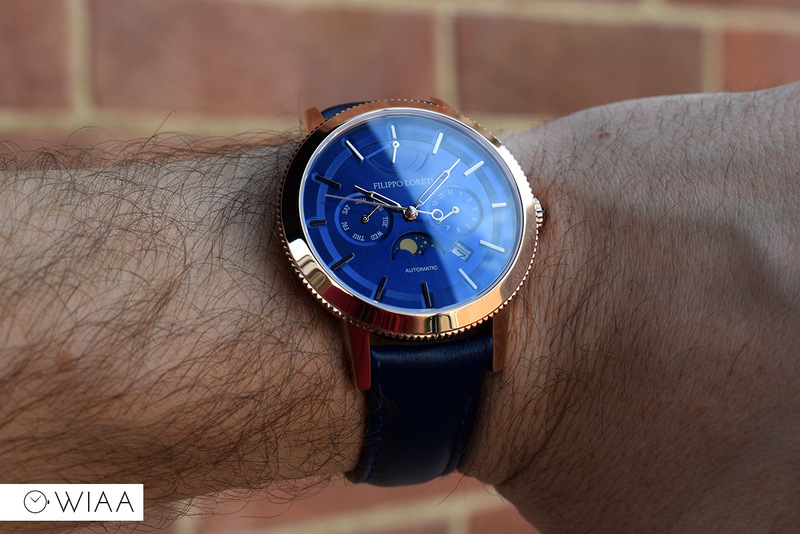 The 24 hour indicator at 6 is disguised as a day / night indicator with a blue base. 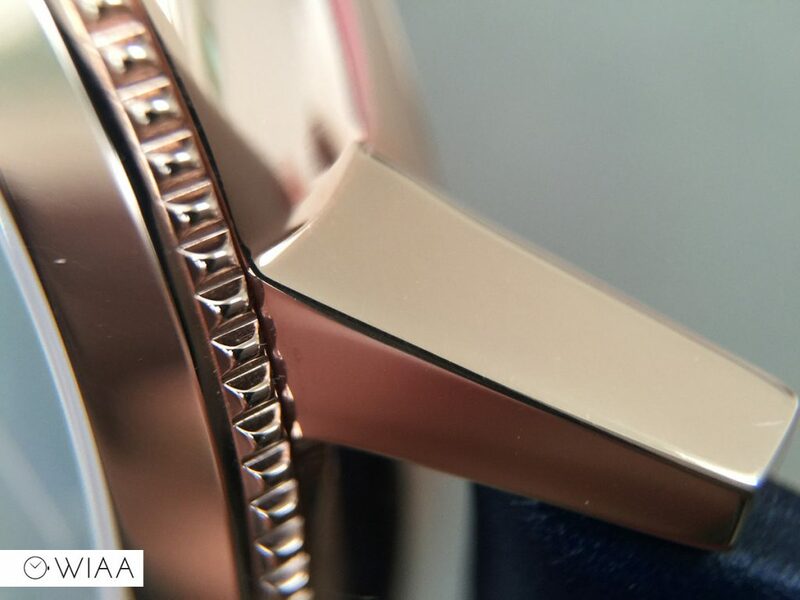 It has a sunburst effect exuding out from the centre, which imparts a lovely reflection. It’s multi-layered, which provides a sense of depth. 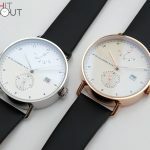 The subdials are at lowest level, with the outer edge surrounding the hour markers at the highest level. 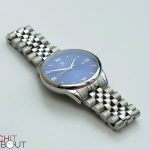 The applied hour markers are thick, signifying good quality. 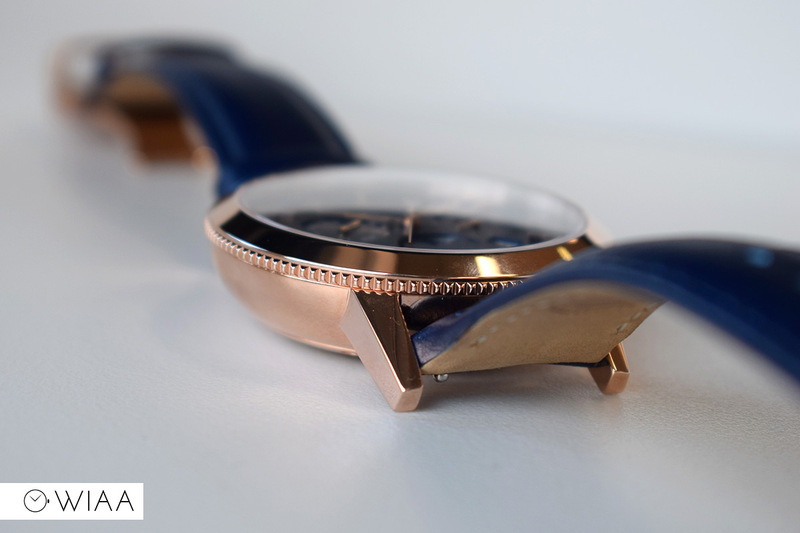 They are polished rose gold to match the case and catch the light really well. They’re also an intriguing shape that you don’t necessarily notice immediately – not just a straight baton; but rather a baton with a curved top. The hour and minute hands are quite unique in design, being skeletonised syringe shaped. 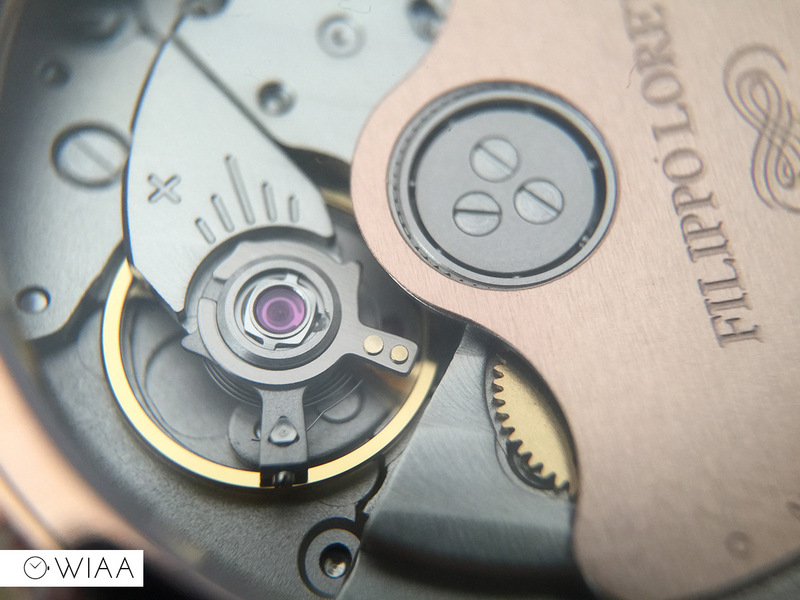 There’s a hollow disc acting as counterweight on the straight second hand, and the other subdial hands are all simple straight points. 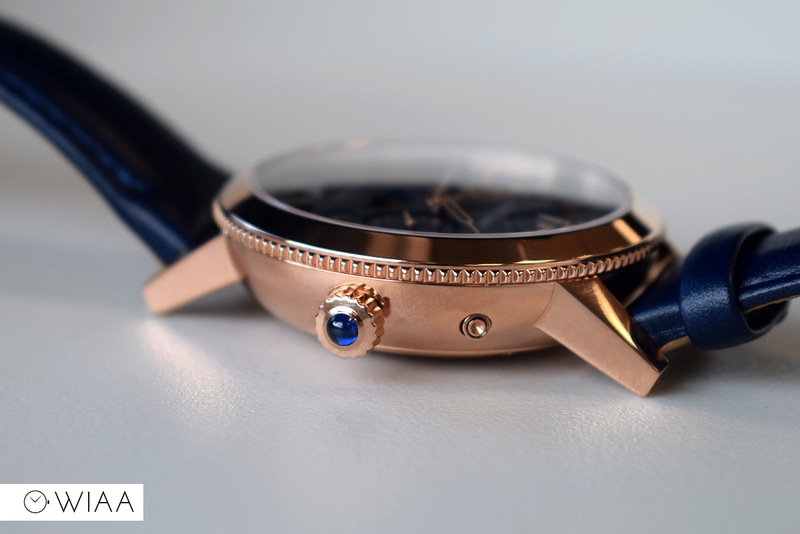 All the hands are polished rose gold matching the case. 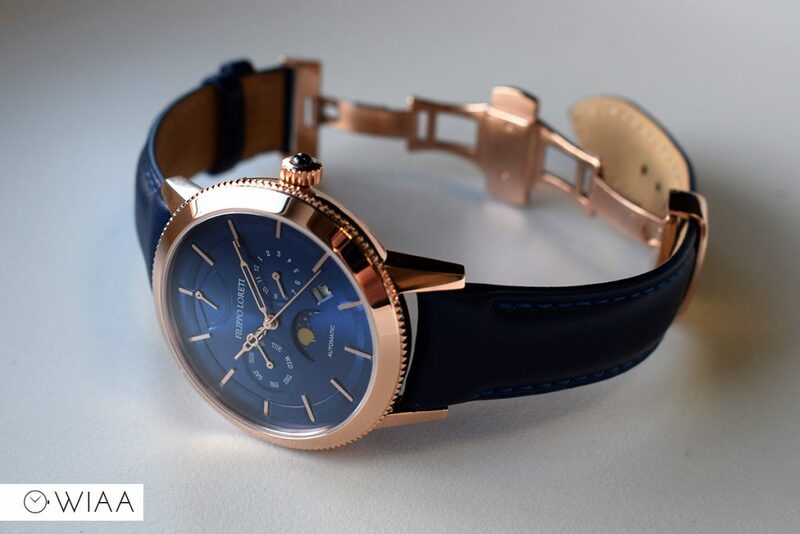 The blue works so well with the rose gold; really classy, stylish and elegant. 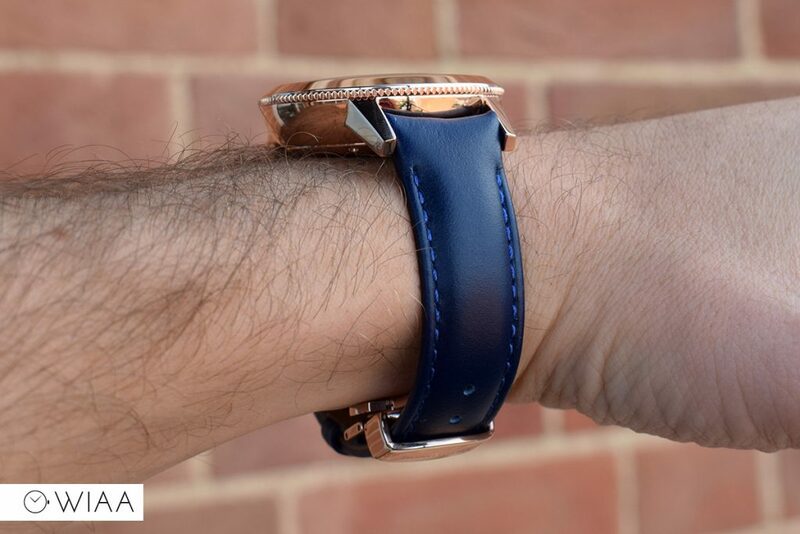 The strap is made of full-grain blue Italian leather, and it’s very good quality. It’s thick, supple, and well fabricated. 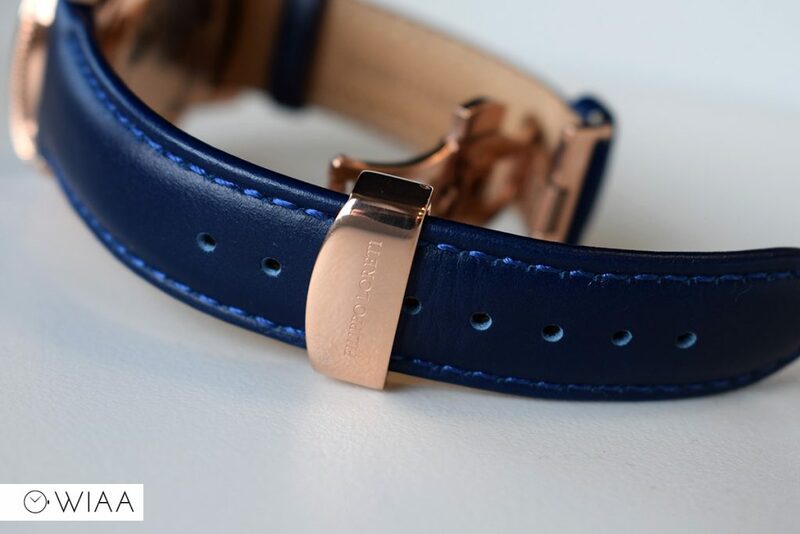 The strap also comes fitted with quick release pins, a positive on any watch. 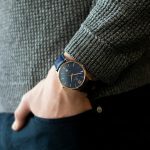 The strap features lighter blue stitching which complements the main darker blue running throughout the watch very well, and keeps things interesting. 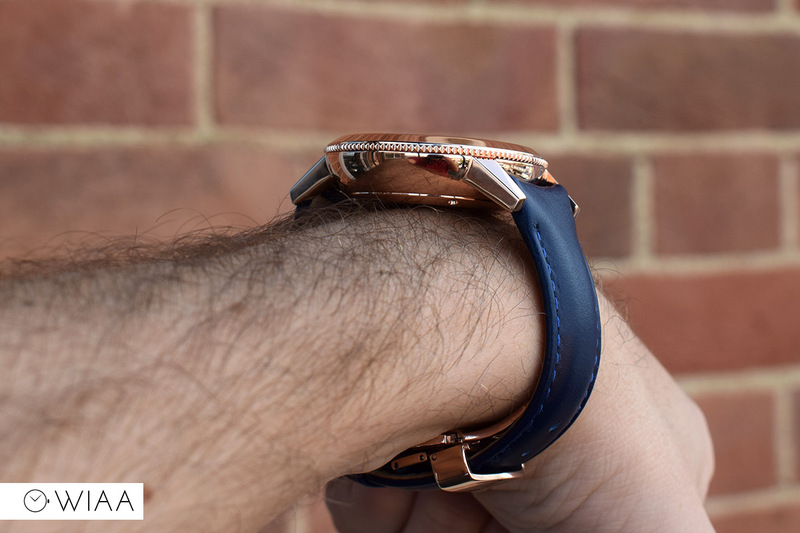 You strap the watch on using a polished rose gold butterfly clasp. It’s the same kind of clasp you see quite a lot, so whilst it’s not amazing it’s perfectly suitable and well made. 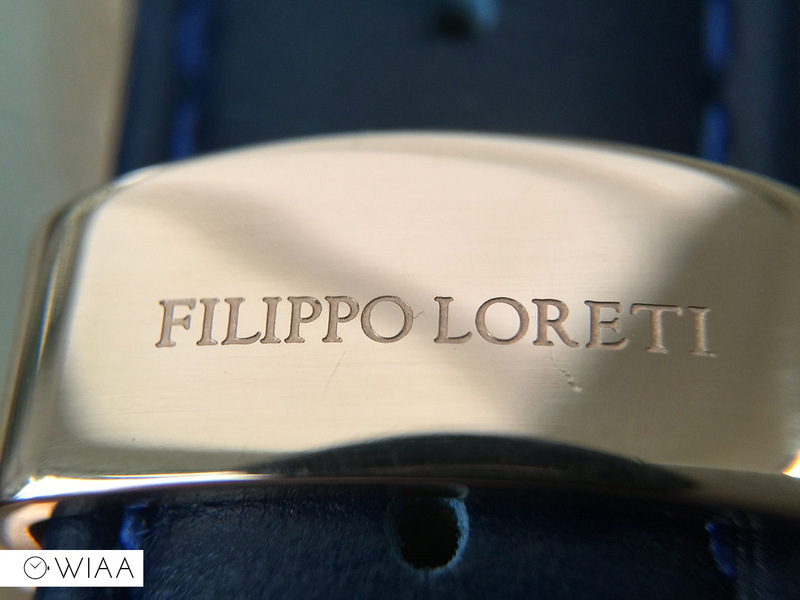 The Filippo Loreti logo is engraved on the top bar. 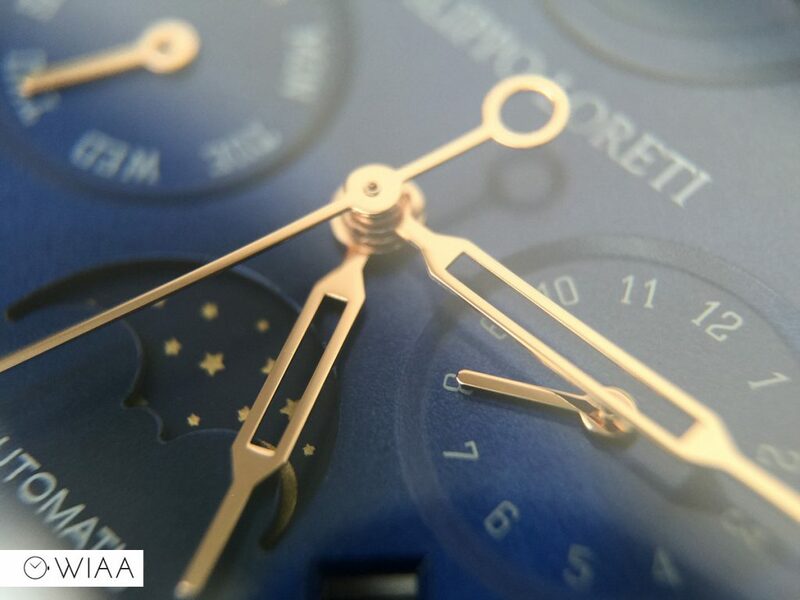 The movement used in the Venice is the Miyota 9100 series. 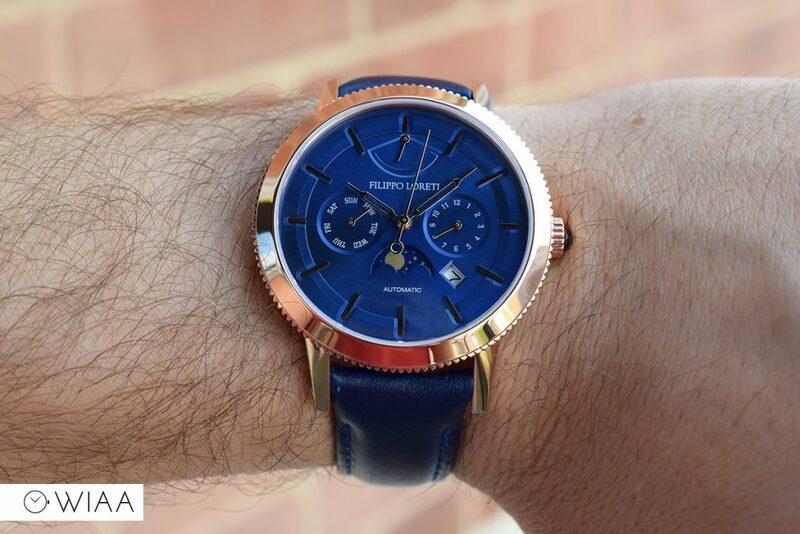 It runs at a high beat of 28.8k bph, rocks 26 jewels and has a 40 hour power reserve, which is visualised by the indicator at 12. 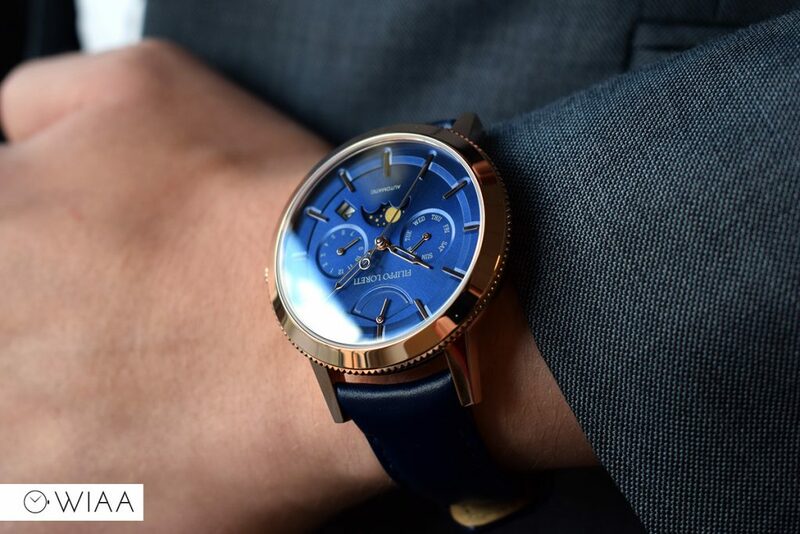 In addition to the power reserve at 12, the day indicator is at 9, month at 3, and a day / night indicator at 6 (which is a glorified 24 hour subdial). There’s also the date window at 4:30, which has a white wheel and is sat quite deep. 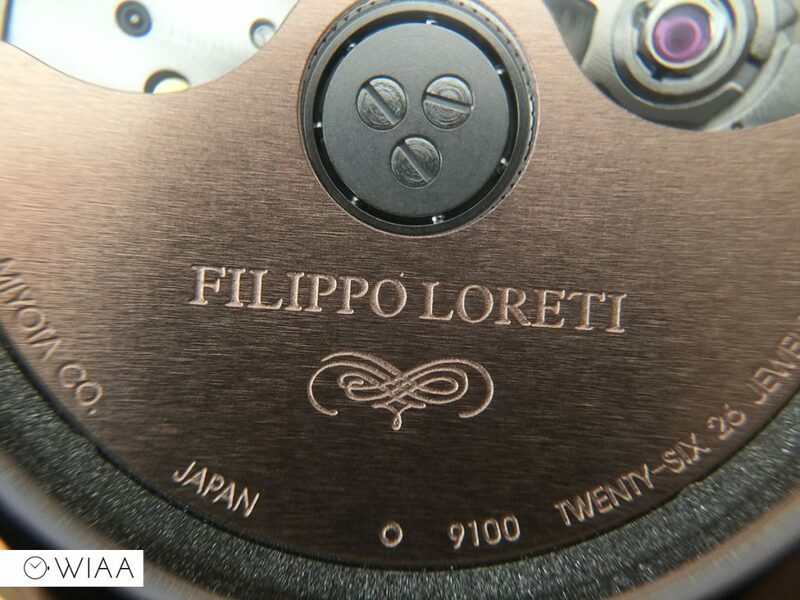 I’m always happy to see custom rotors, and the Filippo Loreti offering is pretty good. 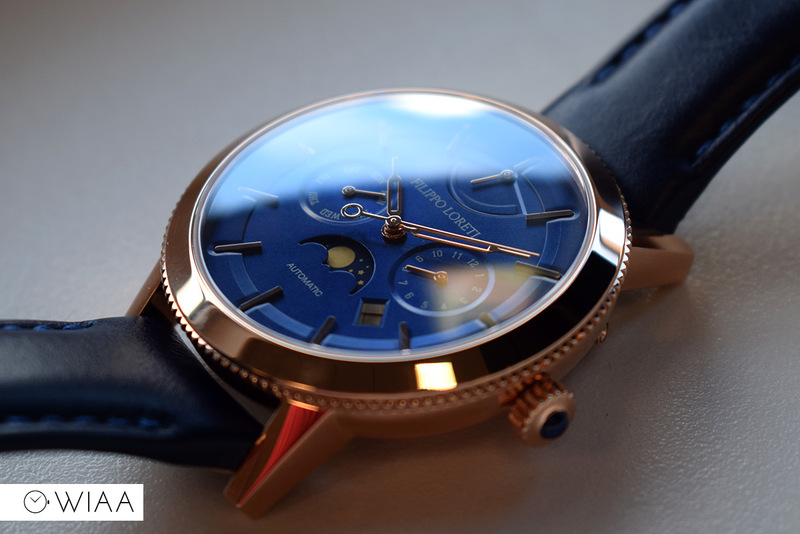 A gold plated rotor with their logo engraved on the top, alongside some other specs too. There’s no doubt about it, Filippo Loreti know what they’re doing when it comes to marketing. 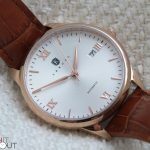 As it would be for anyone stating this: it’s a bit of a bold claim when they say the Venice is the same quality as a +£1000 timepiece (that would be a matter of opinion), but I definitely can say that it’s an extremely splendid watch for the money. 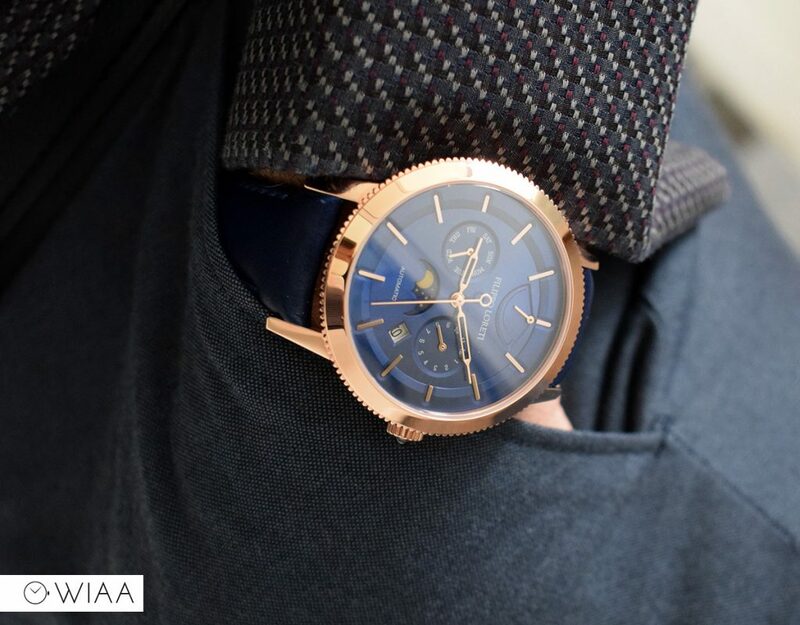 The colour scheme of blue and rose gold is a gorgeous tried and tested concoction; glamorous and luxurious. 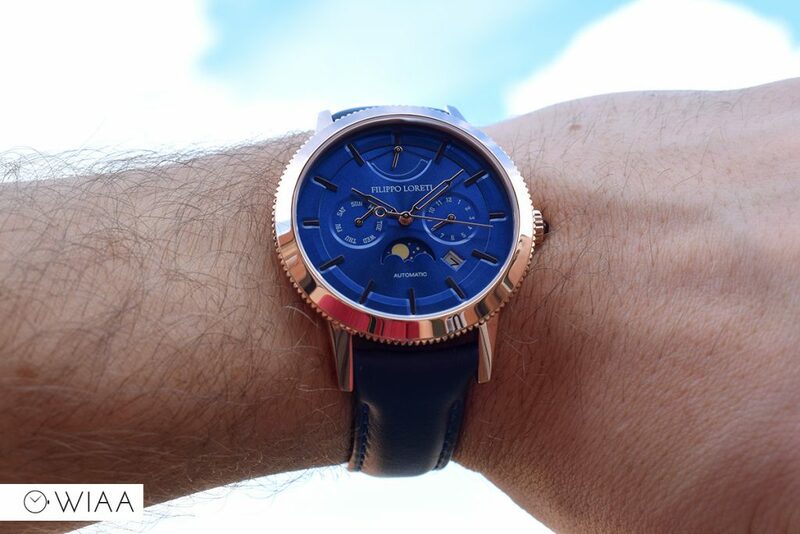 It’s a timepiece that catches the eye, and I’ve received comments every time I’ve worn it. The build quality is flawless, the design classy. I think you have to look past the hype they stir up, and also the difficult start they endured. 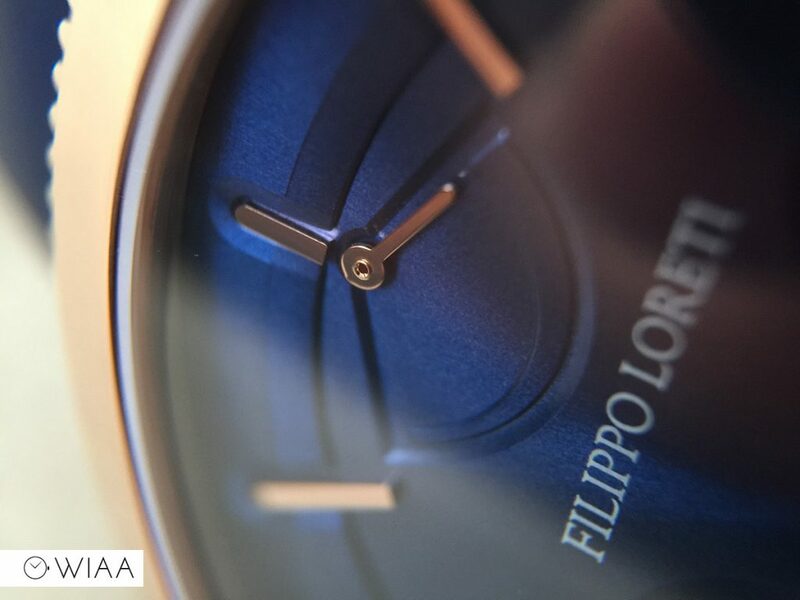 But once you do, and look at the here and now, and the watch Filippo Loreti are selling at £399: it’s genuinely a lovely watch for the money.